Villa Ialeira in Stoupa with private pool and amazing sea views. 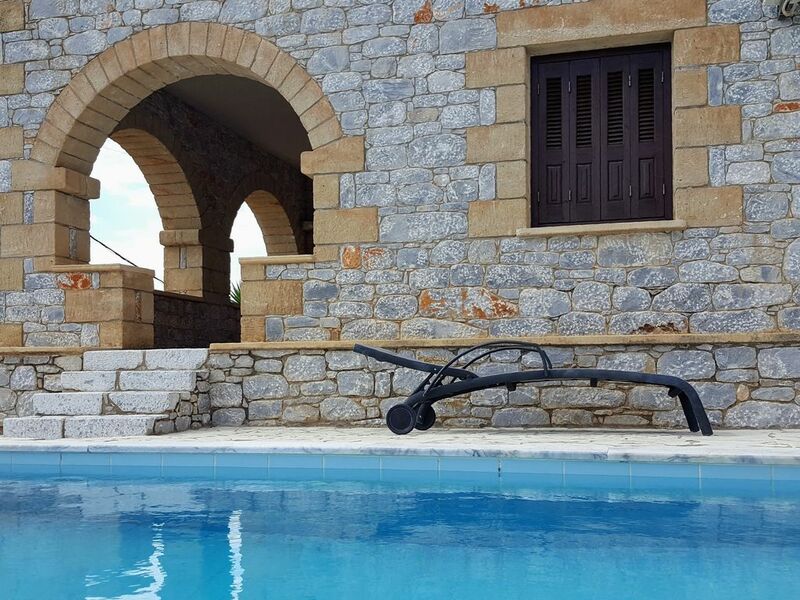 Amazing sea views, private pool, privacy, only 2.5 km away from Stoupa beach. If you are looking for a holiday villa equipped with all the modern amenities, with private pool and privacy, enjoying amazing sea views and unique sunsets, located in a very quiet neighborhood away from it all but so close at the facilities of the main resort of Stoupa, then consider villa Ialeira. Villa Ialeira is one of the three detached villas of the complex "Rathimata villas" each one with it's private swimming pool, located on a 4000 sqm plot. VILLA IALEIRA LAYOUT : From the parking lot a small bridge leads to the upper floor through the main entrance of the villa while another entrance door is also available at ground level. The upper floor consist of open plan living area with fireplace, dining and full kitchen. Two patio doors leading to the upper veranda enable you to dine outside. The views are amazing. An internal staircase leads at ground floor of the villa which consists of one double bedroom and one bedroom with twin beds and a full bathroom with shower. Both bedrooms leading to front covered veranda with dining. From the veranda as well from the ground level entrance hall you can reach the paved pool area, the stone built BBQ with dining and the utility room with washing machine. The Private Pool (3.5m x 7.0m) has amazing sea view, equipped with sun loungers, sun umbrella, outside shower and has professional maintenance. The secluded area of the villa has local flowers and trees. Villa Ialeira located on a very big plot of 4000 sqm on a hilltop overlooking the village of Stoupa the olive groves and the Messinian Gulf. The villa is detached and secluded. The views from the veranda the private pool and from the inside of the villa are unique and spectacular. The best in the area. The facilities of the summer resort of Stoupa are only 2.5 km away, easily accessible within a short drive. The stone built villa is just 4 minutes drive away from the sandy beaches Stoupa and Kalogria and only 50 km from Kalamata KLX Airport. Along the coastline other secluded beaches are easily accessible by car. Located in a very quiet residential neighborhood with amazing sea views is the ideal accommodation for relaxed and comfortable holiday away from it all. Villa Ialeira is the perfect base to explore Mani and the archaeological sites of the Peloponnese like : Old Kardamili 10 km (10 minutes drive) - Ancient Messini 76 km (1 hour and 20 minutes drive) - Mystras Byzantine Town 98 km (1 hour and 35 minutes drive) - Ancient Olympia 160 km (2 hours and 30 minutes drive). Excellent location for hiking, since the area is filled with many old footpaths and Virou Gorge. From the veranda and the private pool breathtaking views sweeping the Messinian Gulf offers amazing sunsets for total relaxation. In a quiet and tranquil scenery with such stunning view, will find yourself relaxing at the pool area from sunrise till after sunset. The luxury villa is fully furnished and equipped with all modern amenities, yet decorated with authentic vintage objects aiming to offer holiday in style. The delicious local cuisine of Mani with the famous organic olive oil and products from nearby villages, as well the local fresh fish will fascinate you. The owner (Akis) born and raised in this region. After some years in Athens returned to beautiful Mani and built the lovely villas with passion and knowledge of the local architecture (is an architect himself), aiming to offer his visitors the feeling that residing in their own home. The Private Swimming Pool ( size 3.50m x 7.00m & depths 1.20m to 1.60m ) with outside shower is equipped with four sun loungers, sun umbrella and coffee table. Professional pool maintenance. Akis (the owner) will be present to welcome you in Stoupa, to accompany you at the villa and show you around the accommodation, to give you information about local services, beaches, attractions nearby, local cuisine and help if needed. The swimming pool is not gated, therefore, children should be supervised by the parents in the pool and around the pool area. Very comfortable and charmingly furnished villa with a delicious pool. Akis the owner is efficient, friendly and helpful without being intrusive. The best place I have rented on HomeAway. The area is not great for sightseeing although a drive into the mountain area is scenic. But who cares, sun and swimming, lovely scenery, good books, wine and relaxation was what the holiday was about. Enjoy! My husband and I stayed here in June 2018 for two weeks. The owner, Akis, was so lovely, as was his villa. It is very private and the living room felt big with high ceilings. Special mention to the super comfortable bed. The views were also beautiful and we loved staying up in the hills away from all the tourists. It's a nice, quiet area. It's a great base to explore the many delights of the area. We highly recommend this villa. It's pretty well equipped and is decorated nicely. We felt really at home. The pool is also quite large and clean. I'd say we are a fairly fussy couple when it come to accommodation and highly rate this one. Ticked all the big boxes for a comfortable stay. Even when the weather was bad, we were happy chilling in the villa. Thanks again for a lovely stay! The local Village of Stoupa was a little to quiet for us with 2 teenage daughters. The villa is clean and tidy with only limited cooking utensils, we had to go out a buy a measuring jug, tongs for the BBQ and clothes hangers. We also could have done with extra blankets as the A/C was quite cool. The swimming pool was clean and we used that daily, temperature was refreshing. This villa and are is good for families with maybe slightly younger children or adults only. The journey from the Kalamata is one hour by car and winding roads the whole way. We stayed in Villa Ialeira September 2016 and had a wonderful, quiet, relaxing holiday. The villa is very well appointed and had everything we needed. The area is much greener than we expected and the scenery... cloud toped mountains, seascapes and sunsets... is spectacular. The drive from Kalamata in a rental car is... 'interesting'... Akis met us in Stoupa and took us up and introduced the villa; we were in the pool within half an hour. From then on we just enjoyed our break. Akis checked in on us while passing a few times to make sure we were OK.
We spent most of our time by the pool and drove down into Stoupa or Aghios Nikolias (nicer) for dinner (a car is required at this villa) or to the friendly supermarket in Stoupa for provisions. The Wi-Fi, air-con etc all worked well and we were surprised to find that hot water was constantly available. The evenings were quiet and star-filled. I have to mention that while we were there the region suffered the worst thunder storm for some time. The rain, overnight, was torrential and caused much damage in the local area. We were perfectly safe in our well constructed villa and even the emergency lighting worked (it was a very bad storm). We stayed out-of-the-way next day and things soon returned to normal. In general tho' the weather was fine. We can thoroughly recommend this villa for adults who want a quiet, relaxing holiday with spectacular views... and if the neighbours overhanging fig tree is bearing fruit... well it would be a waste not to have some fresh figs for breakfast. Top quality villa in great location. We really enjoyed our two weeks at Villa Ialera. It is a beautifully designed villa, combining traditional and modern features. The place is really quiet and relaxing, and the pool is luxurious. The sunsets are sublime. We used the BBQ many evenings, and also enjoyed sampling the tavernas by the harbour at Agios Nicolaos. Akis is a wonderful and very attentive host. I have no hesitation in recommending this villa. We spent two glorious weeks in villa Phoebe. Everything was perfect. It was very peaceful and the view from the terraces breathtaking. Akis, the owner, lives nearby and was extremely helpful. There are two supermarkets and an excellent bakery nearby. There is plenty to see and do in the area but your own transport is essential. STOUPA is a seaside village in west Mani region gifted with stunning sandy beaches which stretch along the coast line. It's packed with great restaurants, seafood taverns, Greek taverns, cafes, pubs and nightclubs, as well as with plenty of shops and all type of services. But Stoupa is not only about family holidays. It is the gateway for exploring the magnificent scenery of Mani on foot, by bike or by car and the ancient sites of Ancient Messini, Sparta, Mistras and Olympia, are easily reached from here. The BEACHES, Kalogria, Stoupa, Delfinia, Ritsa, Foneas, Pantazi and Gnospi, all in a few minutes drive away. Along the coast there are other charming SEASIDE VILLAGES to visit, like Kardamili, Agios Nikolaos, Agios Dimitrios and Trachila. Each one is unique and is well worth a visit. In a distance from 1 to 15 km from the villas, there are lovely MOUNTAIN VILLAGES to explore, that takes you back in time 60 years ago. The most of them have a small tavern or two where you can stop and enjoy dishes prepared with local products. The delicious local cuisine, make these destinations more worthy of your visit. PELOPONNESE REGION is the southernmost point of mainland Greece. It is a magical different region where you will discover the beauty of rural Greece. *spend blissful holidays exploring the stunning coastline with idyllic beaches and quaint fishing villages. *travel inland and will find a Tranquil Landscape untouched by time, Ancient Temples, Byzantine Churches and Venetian Castles that evoke memories of a forgotten world. MESSINIAN MANI is a stunningly beautiful area in the southern Peloponnese region in Greece. It has fascinating and colorful History and impressive unique Architecture. Benefiting from an ideal climate, the absence of heavy industry and large cities, the area has a very clean environment, stunning mountain scenery and a crystal clear sea. SIGHTSEEING : More than 200 Byzantine and post Byzantine small churches with magnificent frescoes is scattered in the greater Mani area in Greece. Worth visiting are also the famous Mani towers such as Douraki at Kastania, Kitriniari at Exohori, Mourtzinou at Old Kardamyli and Christea at Agios Dimitrios. The famous in the world Dirou Cave (30km) and the unexplored Cave of Katafygi. Old Footpaths and the fantastic Vyrou and Noupanti Gorges. Mistras Byzantine castle city (98km). HIKING : There are many old footpaths and the beautiful Virou and Noupanti Gorges . Viros gorge is 20 km long and is located just outside Kardamili. Its wild beauty is similar to Samaria gorge. Viros gorge is surrounded by many different signed routes, all of which pass by scenic villages with Byzantine chapels and beautiful stone buildings. You can walk until Viros river springs (2hours and 30 minutes). After that the gorge becomes difficult to walk through. Close to Viros springs several old flour mills are still preserved. The route starts from old Kardamili by going up inside the gorge. After almost an hour you will see the white/red sign that leads to Likaki monastery. Continuing towards the gorge's bed and after an hour you will reach Sotiros monastery located in the right side of the gorge. There is a visible pathway which goes upwards and leads directly to Pedino settlement. CYCLING : There is a paved path along the coastline between Stoupa and Agios Nikolaos. It is specifically for pedestrian either bicycle use and is about 2.5 km in length. It offers wonderful sea views with a mountain background. DIVING : In Stoupa and Kardamili village you will find diving center which will give you the opportunity to discover the wonders of the underwater life. OFF-ROAD : Vassiliki Forest, one of the greater black pine forests in Europe, is easily accessible with an SUV from Saidona or Milia village, an alternative way to wander in Taygetos mountain. GOLF COURSES : Costa Navarino new golf courses, 85 km (less than 2 hours drive). Arrival not before 15:00. Departure not after 10:00 (if not "check in" the same day a new guest "check out" can be later). The villa is licensed by the Greek National Tourist Organisation (1249K91000253000).